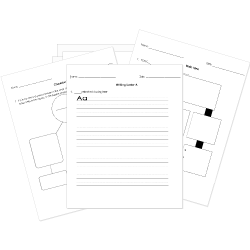 You can create printable tests and worksheets from these Grade 2 African-American Literature questions! Select one or more questions using the checkboxes above each question. Then click the add selected questions to a test button before moving to another page. What word did Granna Rabbit teach everyone? How did Li'l Rabbit feel at the end of the story? How did Li'l Rabbit help with the party? He sang a special song. He gave everyone a big hug. At the end of the party, Li'l Rabbit was sad. Why was Li'l Rabbit sad? Granna Rabbit was still sick. He didn't bring anything to the party. Li'l Rabbit went home. What did he find when he got there? His brother had opened his gifts. wanted to help Granna Rabbit. wished him a Happy Kwanzaa. Which word does NOT describe Granna Rabbit? What was wrong with Granna Rabbit? Li'l Rabbit decided to bring a to Granna Rabbit. Why wasn't Li'l Rabbit allowed to help with Kwanzaa activities?